Lynda Benglis (b. 1941) has always been interested in the idea of transformation. She reinvented art forms as a pioneer creating sculptures out of paint, melted wax, and latex, thus blurring the boundaries between painting and sculpture. She took on the rules of the art world with her infamous 1974 Artforum ad, which interrogated the lack of attention paid to work by women artists. And she “bedazzled Minimalism,” imbuing the staid, masculine genre with color and shine. Her work Eridanus (1984), currently on view at NMWA, continues this interest in completely transforming material. In the wall-mounted sculpture, bronze, zinc, copper, aluminum, and wire are manipulated to appear light as knotted fabric, a bow floating on the wall. Thus, in the hands of Benglis, tough industrial material becomes delicate and decorative. Eridanus is often read in a feminist context, as a piece working to redefine mainstream perceptions of femininity through craft and material. Her choice to rework a typically masculine material into a shining bow of feminine associations can’t be overlooked. But Benglis has stated, “I am a permissive artist. I allow things to happen. I believe the viewer is half the work.” This sentiment allows the piece itself to continually transform—to intrigue and challenge each set of eyes that come upon it. For Rodarte, the Mulleavys transform simple fabrics to evoke emotion and ideas. For example, inspired by a trip to Death Valley, their California Condor Spring/Summer 2010 collection underscored their use of narrative and nontraditional techniques to convey complex ideas. To evoke a futuristic desert landscape for this line, the Mulleavys distressed their materials—dyed cheesecloth, leather, crystals, macramé, and plastic—by painting, burning, shredding, and sandpapering them. These transformed materials encase the figure in a loosely plaited network of pattern and texture. 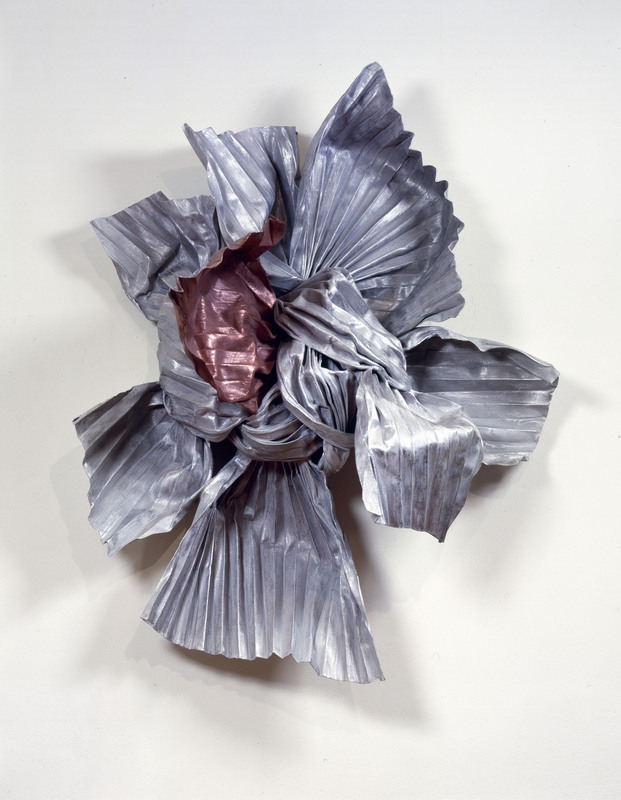 This entry was posted in From the Collection, NMWA Exhibitions and tagged Connecting the Threads, Eridanus, Lynda Benglis, Rodarte by Women in the Arts. Bookmark the permalink.